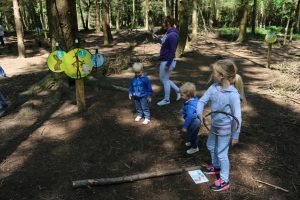 I had been told by so many people how good the Gruffalo trail at Wyre Forest was and Reuben went there on a trip with the school and loved it. Sadly we never got to do this trail so when I heard that it had changed to the Stick Man trail I knew we had to go. The Stick Man is one of our favourite bed time stories, and the children enjoy it so it was a must do. Wyre Forest is near Bewdley and took us about 45 mins to get there. The car park is really good plenty of spaces and its gravel so no mud to step into when getting out of the car. We had picked a lovely sunny day so it was really dry for us. 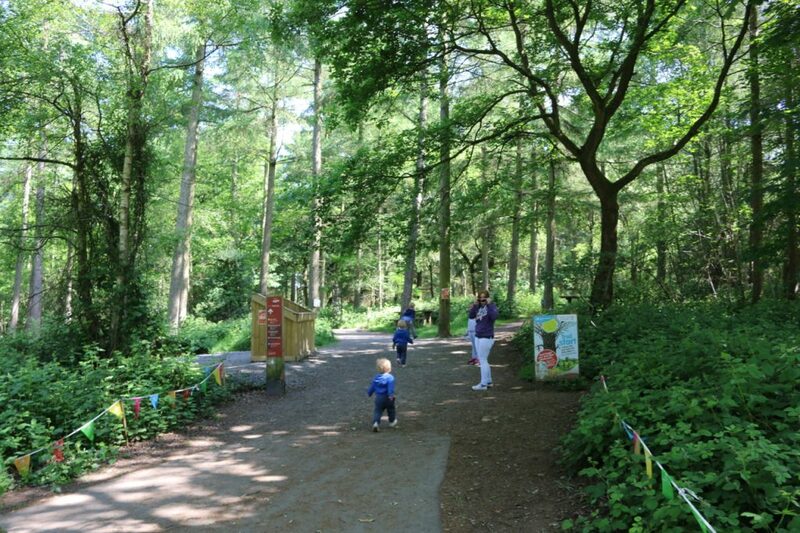 When you enter the car park you can see the visitors centre straight away its just behind a play area. The kids wasted no time getting in there and exploring, and as play areas go it was a pretty good one. Nothing too big and scary but enough balancing beams and poles to slide down to keep the older ones entertained as well as the little ones and all soft under foot. All the bits of paper to complete the activities around the trail. You have paper to do tree rubbings and also a tick sheet for when you find all the characters out of the book. The trail starts just a little way up from the beautiful visitors centre. We had lots of fun walking round the trail. It was easy-going and you can take pushchairs with on problems at all. You can also take furry friends if you wanted to. We built a bird’s nest, threw hoops (made from sticks) over the characters, and threw sticks down a chimney. 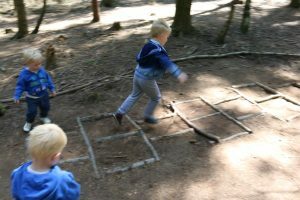 We played hopscotch and noughts & crosses. 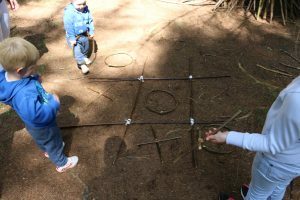 There are some challenges as well like building a tall tower from sticks, seeing how many pine cones you can move from one box to another using sticks as chop sticks, and jumping over a log for 30 secs and recording how many times you did this. 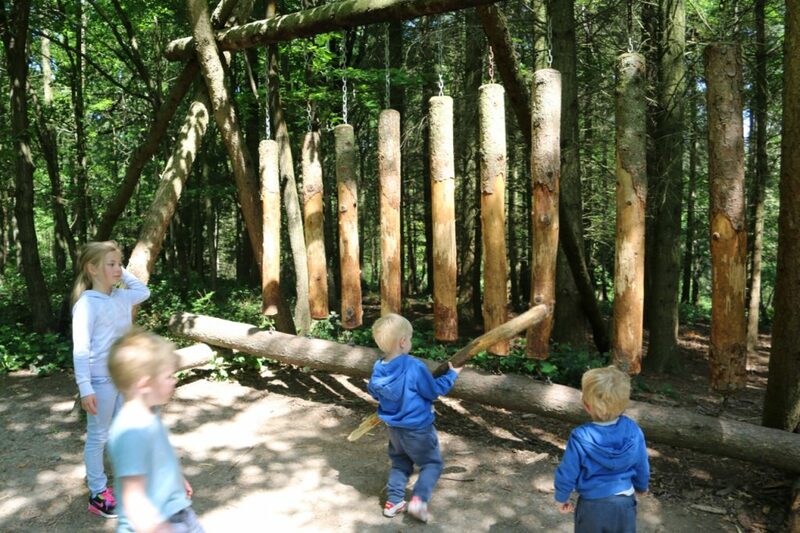 Towards the end of the trail you have a huge xylophone made from logs that we all had a go at playing, then we did our bark rubbings as well. It took us about an hour but we did rush a little as we were tight for time sadly. We could have spent a lot longer walking round. Also we could have missed anything out and done it faster if needed. 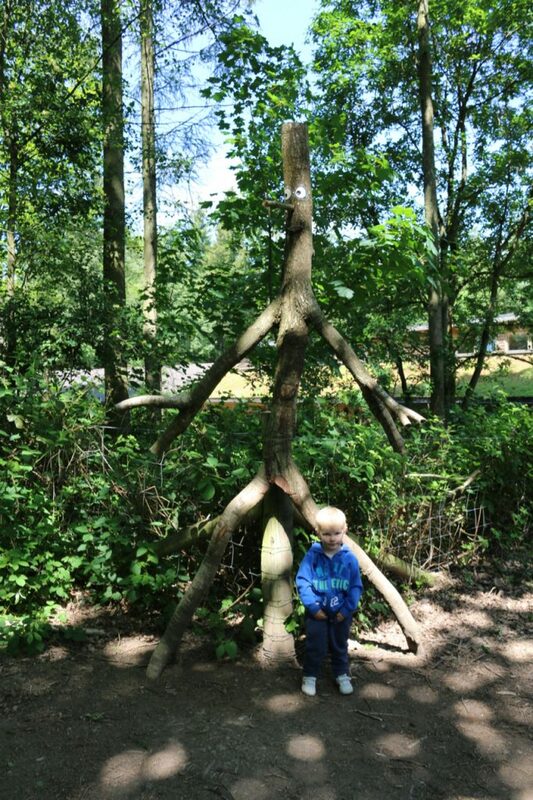 At the end there is a huge stickman that you can have your photo taken with. Overall the trail is brilliant and we really enjoyed it. However we do have little ones and there is a crazy amount of stingers along the trail and on multiple occasions we had to pull Seth away so this was a little stressful. Also when we were doing the bark rubbings they had a log with a metal plaque on which had a picture of the stick man on for you to do a rubbing of. 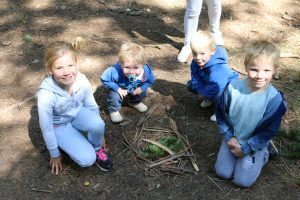 But it appeared that the log was placed in an ants nest and I’m not talking our friendly little garden ants I’m talking enormous child eating ants and of course Seth and Elijah decided to kneel down and have a chat with them before we realised. Bugs are to be expected in a forest, but was just a shame that the plaque to do the rubbing on was placed in their home. After the trail we went to the visitors centre. Now normally these places are just somewhere to go the toilet and get a rubbish cup of tea, but a lot of them have really been stepping their game up lately. I must say the visitors centre at Wyre Forest is absolutely lovely. It has a country cottage feel to it with wooden tables and log burner. All the tables have pots with sugar cubes in and the cake display was beautiful. 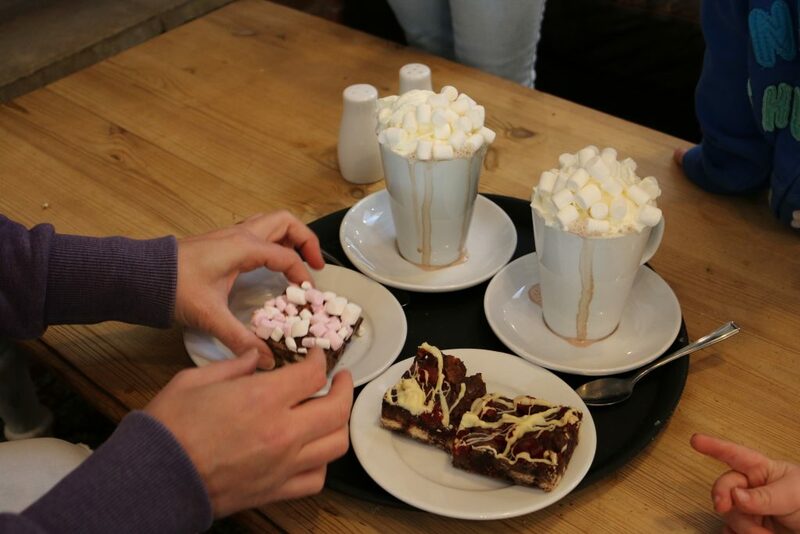 They also sold luxury hot chocolates complete with squirt cream and marshmallows and a selection of hot foods (toast, sausage rolls bacon sandwich etc.). The staff were delightful, very friendly and chatty. Next Post Teachers Gifts: Do You / Don’t you?